I love my iPad, but I made the mistake of buying a 16GB model—that’s not enough storage for all my apps, home videos, movies, TV shows, photos, and documents. 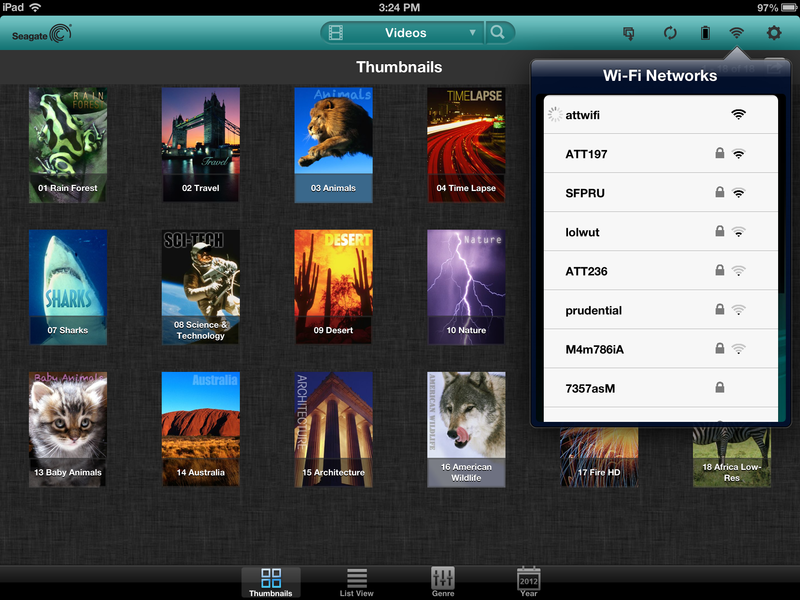 I can rely on cloud storage, but since my iPad is Wi-Fi only, I like having extra local storage. I’ve been using a Kensington Wi-Drive, but it has its limitations. I recently replaced the Wi-Drive with Seagate’s $200 Wireless Plus, a Wi-Fi equipped portable hard drive that offers 1TB of storage. It has a few limitations of its own, but it’s a nice storage device with good iOS apps and useful features. Internet Access: Connect the Wireless Plus to Wi-Fi Internet so you can maintain an Internet connection while using the drive. Using the Wireless Plus with an iOS device requires the free Seagate Media app for iPad or iPhone. (An Android app is also available.) The app provides quick and easy access to the drive’s files, with both a Thumbnail and a List View that I use frequently, and Genre and Year views that I almost never use but find helpful at times. A computer or mobile device can connect to only one Wi-Fi signal at a time. That means the device can’t connect directly to Wi-Fi Internet when connected to the Wireless Plus. Fortunately, the Seagate Media app allows the Wireless Plus to connect to Wi-Fi Internet, giving your computer or mobile device Internet access. When connecting to a public Wi-Fi hotspot that requires authentication, the app will ask for authentication and then switch over to Safari, where you enter a username and password. The performance hit is slightly noticeable but not frustratingly so, with webpages taking a short pause before loading. Web UI: Computers can connect to the Wireless Plus via Wi-Fi. You'll use a browser to access the drive's contents. To connect to the Wireless Plus wirelessly on your computer, you connect to the drive via Wi-Fi and then launch your browser, which automatically goes to a Web interface for the drive (you can also enter http://172.25.0.1 as the URL in your browser). 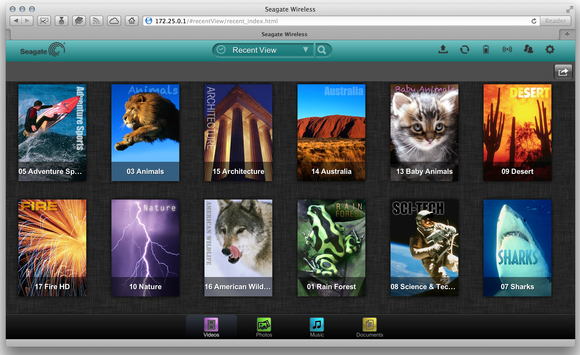 The browser interface is very similar to Seagate Media app, so it’s familiar territory. Moving files back and forth between my iPad and the Wireless Plus, and between my MacBook Pro and the Wireless Pro, is smooth but unfortunately, you can’t delete files using the Wireless Plus app or through the browser interface. To delete files, you have to connect the drive to your computer using the included USB 3 connector. Streaming media files from the drive to my iPad also went without a hitch. 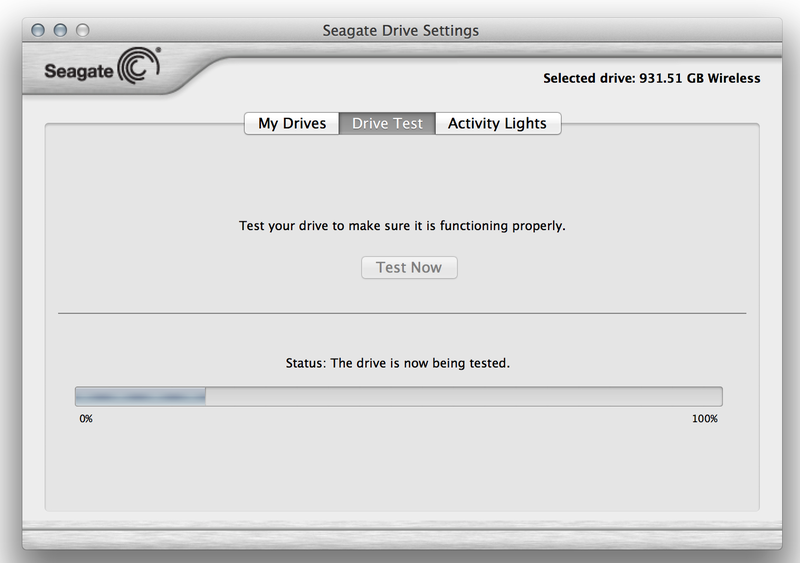 Mac Utility: Seagate includes a Mac app that can test the Wireless Plus, but it doesn't do much. To be able to write to the Wireless Plus while connected to your Mac via USB, you must install the Seagate software bundle that includes a limited edition of Paragon NTFS for Mac, which allows Macs to write to NTFS-formatted drives. The Wireless Plus needs to be NTFS formatted, and Macs can read NTFS-formatted drives but not write to them unless you install a third-party software like Paragon. The software bundle also includes an optional Seagate Drive Settings utility that tells you the available storage, the drive’s serial number, and other information. The utility also has a basic Drive Test function for troubleshooting. It’s a helpful little utility but it doesn’t do a whole lot, so it’s not necessary to install it. Design: The Wireless Plus doesn't look much different from any other hard drive—that's not necessarily a bad thing. The drive itself looks like any ordinary hard drive and it feels sturdy. The Wireless Plus doesn’t have a battery level gauge on its case, which would have been a convenient feature. To check the drive’s battery life, you have to use the Seagate Media app or the Web interface. Seagate claims a 10-hour battery life, which is plenty. The Wireless Plus provides a ton of storage and easy accessibility for all my devices. It has found a place in my backpack next to my iPad—at least until the 1TB iPad eventually comes along. With 1TB of storage and the ability to connect to a mobile device or computer wirelessly, the Wireless Plus is a handy portable hard drive that's great for media consumption.